This is a comprehensive study of patrons in the Italian quattrocento. It should be of interest to art historians and their students and to lovers of Renaissance art and civilization. At the start of the 15th century the patron, not the artist, was seen as the creator and he carefully controlled both subject and medium. In a competitive and violent age, image and ostentation were essential statements of power. Buildings, bronzes or tapestry were much more eloquent statements than the cheaper marble or fresco. The artistic quality that concerns us nowadays was less important then than perceived cost. The arts in any case were just part of a pattern of conspicuous expenditure which would have included for instance holy relics, manuscripts and jewels - all of which had the added advantage that they were portable and could be used as collateral for bank loans. Since Christian teaching frowned on wealth and power, money had also to be spent on religious endowments made in expiation. But here too the patron was in control, and used the arts and other means to express religious belief, not aesthetic sensibility. Thus artists in the Early Renaissance were employed as craftsmen. Only late in the century did their relations with patrons start to adopt a pattern we might recognize today. 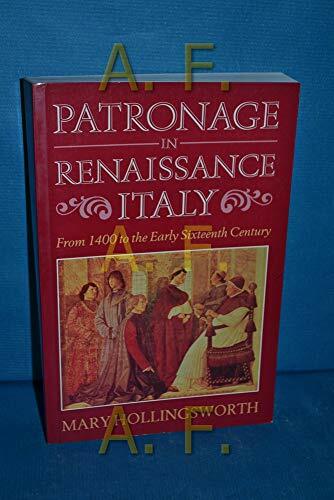 This book, which also discusses the important differences between mercantile republics like Florence and Venice, the princely states such as Naples and Milan, and the papal court in Rome, offers a fuller understanding of why the works of this seminal period take the forms they do.